I love contemporary YA, and a book doesn’t require a “high concept” premise to catch my attention. 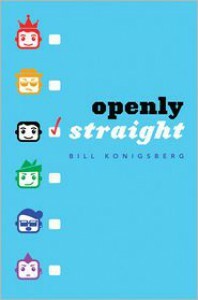 That said, I was immediately drawn to the premise of Openly Straight. What happens when an openly gay teenager decides to move to boarding school and not tell anyone he’s gay? And why would he want to? The answer comes in the first couple of pages, when Rafe says he’s tired of everyone seeing him as “the openly gay kid who had it all figured out.” Rafe’s motivation makes sense, as does his desire to explore relationships with guys without his sexuality creating some kind of barrier between them. His attempt to fit in with the “jocks” at Natick was realistic, especially in the first part of the book, where he seems to second-guess every word and action to try and figure out what kind of impression he’s making. And of course I enjoyed the complications that arise when he develops a crush on another boy and is torn between wanting to keep his secret and wanting to push things to another level in that relationship. I do wish that Rafe’s parents and best friend Claire Olivia had more dimension to them, and that the author had found a way to reveal Rafe’s past other than the “History of Rafe” sections. Those pulled me out of the narrative and I didn’t think Mr. Scarborough’s comments added much to the story other than reinforcing the theme of Rafe keeping parts of his life hidden, even from himself. However, this was still an excellent read. I particularly loved Toby and Albie, who were quirky but genuinely nice guys who grew on me just as they grew on Rafe. And I really loved Ben and his evolving relationship with Rafe.